Industrial Hemp is one of the more interesting new crops that are changing the farmscape of 21st century Saskatchewan. Known historically as a premium source of fibre for rope, rigging, sails and durable textiles hemp is primarily grown in Saskatchewan today for the healthy nutritious hemp seed. Since federal regulations allowing hemp growing were announced in 1998, cultivation has been fairly modest. However, cultivation has been steadily increasing on an annual basis. In 2004, Saskatchewan grew over 1000 hectares of hemp. Because of rising consumer demand, much more is expected to be planted in 2005. Between a quarter to a third of all Canadian grown hemp is cultivated in Saskatchewan. Saskatchewan has some interesting climatic advantages when it comes to growing hemp as a field crop. A photosensitive plant, hemp responds well to Saskatchewan's long summer days. The extended day length contributes to the rich nutritional profile of the seed. Cool nights and clean environment contribute to making hardy, healthy plants. Farmers across the province are investigating how hemp can be grown sustainably. Hemp has a reputation for being able to be grown without herbicides or pesticides, and to a large extent this is true—if the farmer knows what he or she is doing. To be sure, many organic farmers are finding hemp can be grown in their crop rotations. Soil fertility and weed competition are two issues which have to be addressed. Hemp has a fairly large nitrogen uptake, so it is common to grow hemp after a nitrogen-fixing crop such as alfalfa, or legumes. Alfalfa also chokes out possible weed competitors – while mature hemp is a good competitor, other plants can overtake seedling hemp plants in a dry spring. Oats and barley are two preceding crops which should be avoided: the sizes of seeds are similar to hemp, and so make seed cleaning more difficult. Some farmers will underseed their hemp with white clover, while others will ready their soil by ploughing down a pea crop. As stated, mature hemp plants can be excellent weed competitors. Their broad canopy of serrated leaves chokes out other plants, leaving the land in fairly good shape for the next crop. As well, post harvest, some nitrogen is returned to the soil as hemp leaves and stalks are reincorporated back into the earth. 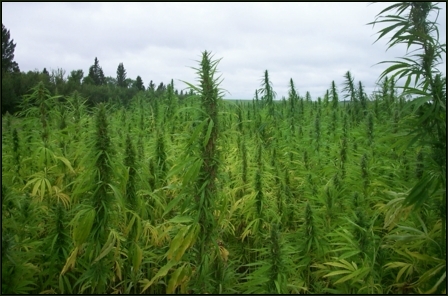 Real world indications to date are the organic hemp and organic farming work well together. Good thing too as modern hemp production is being pulled along by the exciting global trend in organic eating, including an unprecedented demand for hemp seed foods. While there is some historical knowledge of hemp in the diet – Buddha ate hemp seed after all -- contemporary interest in hemp foods only began when cultivation was re-established in Canada. When harvests of fresh seed finally became available, gourmands, vegetarians, athletes, and other healthy living advocates discovered first hand that the humble hemp seed is a nutritional gift package. The seed's oil is rich, and is full of Essential Fatty Acids most notably Omega 3 and 6, including the somewhat rare GLA. The seed's "meat" contains boast of all 12 essential amino acids. Hemp is also a prime source of insoluble fibre. And importantly, it tastes good. Currently, Saskatchewan-grown hemp is being sold across North America. Hemp is usually found in better natural food stores as hemp seed oil, dehulled hemp seed, hemp breads, waffles, ice-cream, granola, burgers, chips, protein powders, flours and energy bars. More uses of this delicious, nutritious seed are being created each year. And as more North American consumers chose hemp as the cash register, this will mean more organic farmers in Saskatchewan will choose to grow it. Why do politicians continue to be so intentionally ignorant on the issue of hemp? The Senate, today, scuttled HB-55 which was the bill to allow NH farmers the opportunity to grow industrial hemp. Even in light of overwhelmingly positive testimony in the Senate Committee on the Environment and Wildlife where supporters outnumbered opponents 10-1 and where one NH Drug Task Force officer was caught in a blatant outright lie, the Senate still kowtowed to their fear of Law Enforcement. The bill had many safeguards built in such as the requirement of farmers to register the GPS coordinates of their field with the Dept. of Agriculture, procure certified seed through the Dept. of Ag., open record keeping and fields to Law Enforcement scrutiny and secure a DEA permit. Yet, in spite of these and other safeguards, Law Enforcement continues to remain the only organized lobby against the reintroduction of hemp to American agriculture. One has to ask themselves why they do this. Fiber or oilseed hemp and the plant that produces marijuana are separate strains of the same genus, Cannabis. The same way sweet corn and cow corn are both Maize. Any farmer knows that he can't plant his sweet corn too close to his cow corn or they will cross pollinate making the sweet corn tough and rubbery and not good to eat. The same simple botany holds true for cannabis. Hemp's pollen is genetically dominant. If someone was to attempt growing marijuana within ten miles of a hemp field, hemp would pollinate the marijuana, shut down THC production and fill it with seed that contained the genetics of hemp rendering the marijuana useless on the street. Law Enforcement has no intention of winning the "War on [some] Drugs". They only want to continue to spend your tax money fighting it. They know, but won't say out loud, that if agribusiness starts growing hemp on a commercial level, hemp pollen will frustrate outdoor marijuana growing east of the pacific north west. If they actually solve the problem of marijuana cultivation they would be looking for new jobs. Proof of this concept comes straight from that NH Drug Task Force officer. She came into a House committee hearing a couple years ago with video of a what she called a "field of feral hemp" in Haverhill NH. Tall, spindly and full of seed. And another of a stand of marijuana in Walpole. Big, fat, bright green, pie sized sunleaves. The visual differences were striking and instantly recognizable. When I asked her what the THC content of the plants in Walpole was, she said about four percent. When asked what the THC content of the Haverhill stand was, she told the committee "We didn't bother to test it. We knew it was feral hemp". Every year they wait until September to cut it down. As they cut it the ripe seed falls to the ground, winters over and the stand comes back the following year. They know where this field is. They could cut it in July before the seed ripens but then the stand would not return and they would not be able to waste your tax money cutting ditchweed again next year. Furthermore, when asked by one of the Senators if law enforcement could tell the difference between hemp and marijuana in the field, she lied saying simply "NO". It is not Law Enforcement's job to create public policy. It is their job to enforce policy created by the legislature. We need credible Law Enforcement and when they come into a committee hearing wearing shiny badges and big guns, testifying from a place of assumed credibility yet completely outside the realm of their expertise or lie boldfaced, that undermines their credibility creating a dangerous public environment. With the onset of world peak oil production upon us now, and the decimation of world forest supplies, we need to shift the paradigm away from fossil fuel and irresponsible forestry and toward a sustainable carbohydrate economy. Hemp will help foster that shift. But if Law Enforcement continues to lie in order to protect their short term wealth generation scheme and politicians continue to obstruct the reintroduction of hemp to American agriculture, and corporate media continues to refuse to do anything resembling responsible journalism around the issue, we, as a society, will surely find ourselves squarely behind the eightball within the decade. At some point, hopefully soon, you have to get out your BS meter and ask it who is really telling the truth here and tell the representatives that are elected to represent you to pull their heads out of the stupor of drunken denial and make hemp happen not just here in NH but the across rest of America as well. Today the Foster's Daily Democrat ran an Associated Press story reporting that the New Hampshire Senate "Says no to hemp". The Environment and Wildlife Committee issued its report on April 27th 2005 that it voted 5-0 "Inexpedient to Legislate" - or in layman's terms kill - the hemp bill HB 55-FN-A, relative to industrial hemp and establishing an industrial hemp special program fund. Absolutely no vision. I wonder, who lobbied the Senate committee to recommend that the bill be killed? Again, we thank you for your cooperation in resolving this matter and appreciate the fact that you chose PayPal to accept payments for your business. If you have any further questions, please contact the PayPal Acceptable Use Policy Department at aup@paypal.com. So, the price of selling hemp products is constant vigilance and educating people on the differences between low-THC and high-THC varieties Cannabis. It was heartening to see the number of people who stepped forward to offer Amie help. Not really David v. Goliath, but Earth Friendly Network v. PayPal. OK, here's the story. PayPal has frozen Hemp Industries Association member Earth Friendly Network's PayPal account for violation of their drug sales policy. They are asserting that hemp seed is a Schedule 1 controlled substance. They do not seem to understand that there is a difference between someone selling 10 Northern Lights seeds and a quarter pound of Hemp Oil Canada's "Hemp Crunch" - Toasted Hemp Seeds. Stunning ignorance. We need to enlighten them. We are hereby notifying you that, after a recent review of your account activity, it has been determined that you are in violation of PayPal's Acceptable Use Policy. Therefore, your account has been closed. You will need to remove all references to PayPal from your website(s) and/or auction(s). This includes not only removing PayPal as a payment option, but also the PayPal logo and/or shopping cart. We thank you in advance for your cooperation. If you have any questions, please contact the PayPal Acceptable Use Policy Department at aup@paypal.com. PayPal does not object to the sale of clothing made of hemp. Our concern lies within the sale of hemp seeds. These are prohibited under our Acceptable Use Policy for Illegal Drugs and Paraphernalia. Therefore, unfortunately we cannot overturn the limitation on your account. Please remove all references to PayPal from your website(s) and/or auction(s). This includes not only removing PayPal as a payment option, but also the PayPal logo and/or shopping cart. If you have any questions, please contact the PayPal Acceptable Use Policy Department at aup@paypal.com. Hemp seeds, hemp oil, and hemp food are NOT controlled substances. Please refer to the links below for relevant US law. Hemp seed and food products are sold across the US, Canada, and around the world. "On 6 February, 2004, the Ninth Circuit (long known as the most liberal and most over-turned federal court in the country) ruled that the DEA had no jurisdiction over hempseed foods. Even DEA said as much: "[Hemp foods] need not be exempted from control under this interim rule, since they are, by definition, non-controlled." Please take a moment to review the information above and reconsider your decision to close my account. I can assure that the hundreds of thousands of health and nutrition advocates who seek out hemp seeds and nutritional supplements will be extremely dissatisfied if this decision is not over turned. Please buy products from the Earth Friendly Network either from their eBay store or their web site. The Hemp Report will keep you posted on this stunning development.